I Am A Reader, Not A Writer and Mary at Sweeping Me. On my stop, I'm giving away a $30.00 Amazon gift card to help with Christmas shopping... or perhaps just to pamper yourself and ease the stress of the holidays! Just fill out the Rafflecopter form and be sure to check out the other awesome stops below. Happy Holidays too you ! You're very welcome! Thank you for entering, and good luck! You're so welcome! Thanks for entering, and good luck! You're welcome, Ellen! Happy Holidays! Thank you so much for the giveaway! Happy holidays! PS. I accidentally left my GFC name on the rafflecopter widget as Debbie W/ instead of Debbie W. (yes, there's supposed to be a period there). Sorry for the inconvenience! No problem at all, Debbie! Thanks so much for entering! You're welcome - good luck! Thank you for the giveaway opportunity!! Love the blog - new follower! Come check me out !! 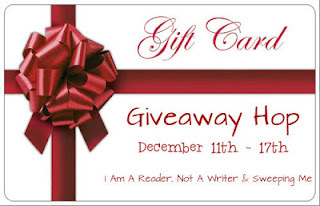 Great Giveaway and Happy Holidays to you !! Wow! Awesome giveaway! Thanks so much for the chance to win! Happy Holidays! Thank you, Alina! Good luck and Happy Holidays to you! Thanks for the awesome giveaway! I hope you have a very Merry Christmas! Lovley giveaway- thanks so much! Thank you for the wonderful giveaway and for being a part of the hop. Happy Holidays! Thank you for stopping by and entering - good luck! Happy Holidays to you! You're very welcome - good luck! Hope you have a wonderful Christmas, also! You're a new blogger to me! Attractive card..!!! love it.....Printed gift cards.